One of my favorite things about my job is meeting other creative entrepreneurs and learning about who they are and why they do what they do. In this new series, Creative Conversations I'll be introducing you to some other creatives. 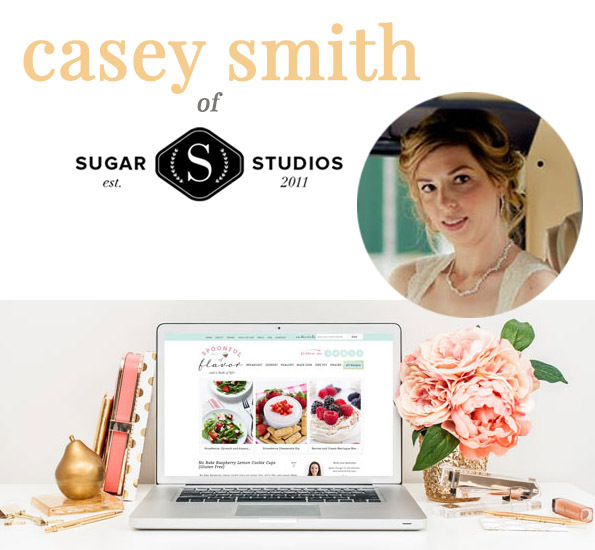 First up, Casey Smith of Sugar Studios. Tell me ALL about you: I'm a professional graphic designer with a Bachelor in Fine Arts. I've been working professionally as a designer for 13 years and created Sugar Studios in 2011. I'm married to my husband and we have our first baby on the way (due in March 2016). We also have a fur baby, a playful Dachshund named Eva. When I'm not working on logos and website designs I love to cook, decorate our home, go into Manhattan our out east on Long Island with my husband. Tell me ALL about your business? What do you do? Why do you do it? : I started Sugar Studios in 2011 on Etsy selling premade logos and clip art. I was looking to start my own business and wanted to offer my design talents to other business owners. Because I was just starting out my work was inexpensive, over time the demand grew and my offerings and pricing changed. Now I specialize in branding and custom blog and website design which are my passions and what I truly enjoy doing the most. What is one piece of advice you'd offer someone who is starting/growing their business? : Go with what you know and don't expect to have everything perfect from the start. Your business will grow and evolve into what it's meant to be. What are some of your favorite resources (books, apps, etc) that have helped you with your business? : I've created a list of resources on my website.